R & A Industries is a stocking distributor of hydraulic and industrial hose, fire hose, and related adapters and fittings. 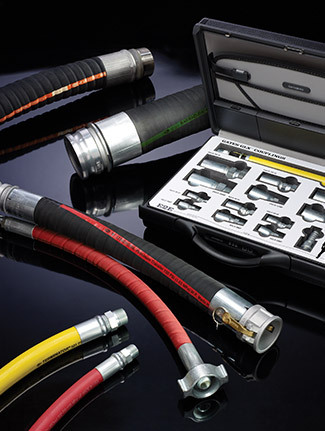 From their facility in Medford, MA; R & A offers it's customers a large inventory of hose and fitting products to keep their operations running with minimal downtime. The varied line of manufacturers represented are such key names as Gates Corp., Dixon Valve & Coupling Co., Hose Master, Key Fire Hose Corp., Faster, and Band-It-Idex, Inc., among many others. Make us your main source for: Hydraulic and Industrial Hose, Quick disconnect couplings, couplers, fittings and adapters, Fire Hose and fittings, Hydraulic Hose Crimpers, metal and Teflon lined hose assemblies, tubing clamps, and Dry Bulk Pneumatic Tanker Parts. Whether it be the need for a new hydraulic hose assembly to keep a piece of equipment running or that adapter you need to replace immediately, you can count on R & A to get you up and running with our fine walk-in service. Also; if your thoughts are to have your own capability to manufacture factory quality hydraulic and industrial hose assemblies, R & A offers equipment and inventory to support you at start-up and on an ongoing basis. In addition, same day shipping is standard practice for in stock items with UPS or common carrier / motor freight.